The white board was a $5.00 second hand score, yes! So needed one! Yesterday I thought up a quick and easy solution for covering up my white and cork boards. (Similar to this solution for my supply shelf. 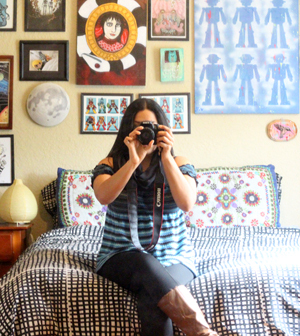 )I used attractive silver binder clips to hang my mandala tapestry on the wall. I screwed a small hook into the connecting wall so I can pull the tapestry back like a curtain when I'm working and easily put it back when I'm done. It's a small change, but it makes my home feel so much more attractive and comfortable while I'm working. The white board was visible from my kitchen and living room so it's a relief to be able to cover it now. I literally feel peace wash over me when I pull the curtain down, it's weird but true! It also adds nice texture my little office corner and makes the whole space feel cozy. Ignore those distracting Christmas lights there, was just playing with some early decorating. My apartment has very tall ceiling so I like the dramatic affect of the tapestry covering nearly the entire wall. If you want a similar solution there are many gorgeous ones for low prices on Amazon. I ordered this one. 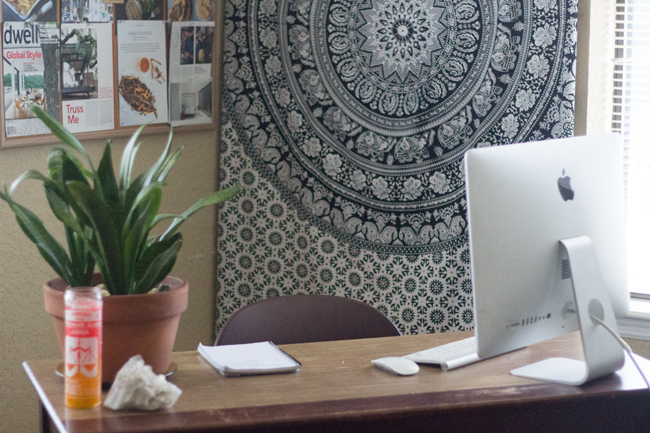 Do you have any solutions for work at home living or small-space working? I'd love to read them! It's something I'm always trying to balance. 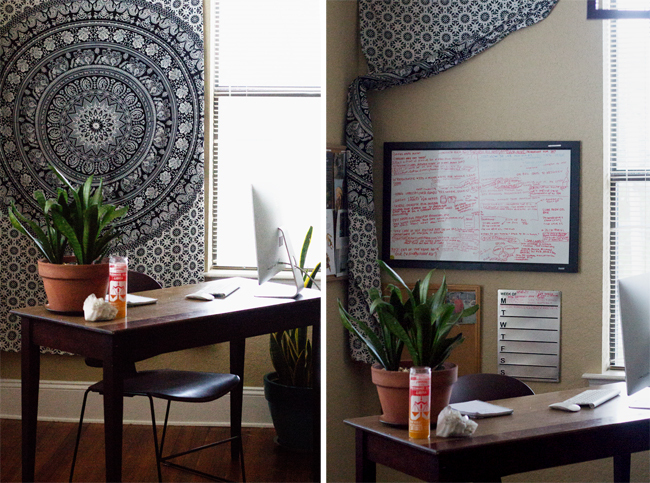 The mandala cloth is beautiful and such a great cover up for the white board! Thank you :) I bought for my market table but it works too well in the office to not use it here. I folded mine to fit the way. 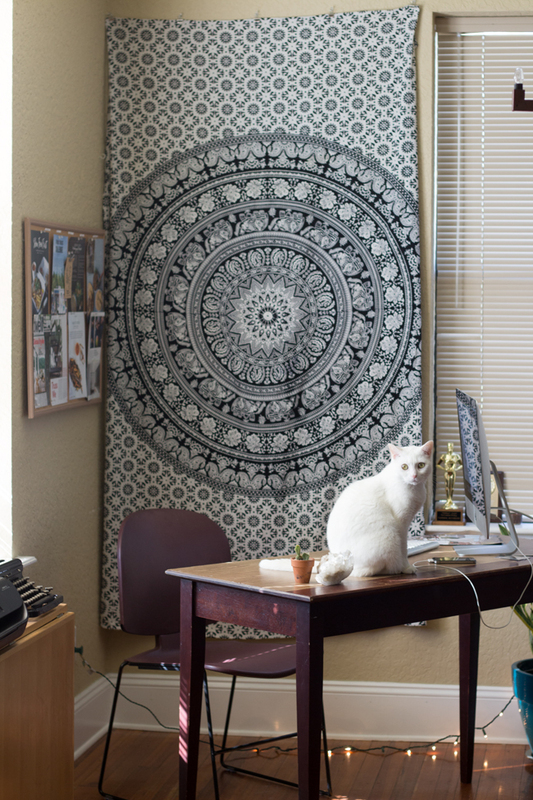 The bigger the better with tapestries, they can make a beautiful impact on the wall. Great idea Vanessa! It really softens the space too. I love those all-purpose. mandala cloths! They're like bohemian duct-tape - so versatile. So weird I don't own one! Haha, they really are. Got something ugly or a mess somewhere? Throw a mandala tapestry on it and it's fixed! Thank you :) I'm enjoying it as I sit here at the desk. Thanks! I'm enjoying hiding my brainstorming mess and added even more cork board craziness to the wall.